E4 from the south : Drive over the bridge ‘Viktoriabron’ and take the first to the left at the stoplights. Follow the street ‘Storgatan’ until it changes name to ‘Kyrkstadsvagen’. Pass the bridge (late 1700) and you will see the house on the right hand. E4 from the North : Drive under the railroadbridge and turn to the right at the stoplights. 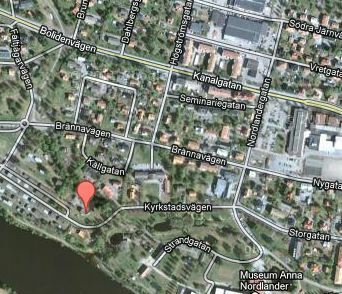 Follow the street ‘Kanalgatan’ right until you have a petrol station ‘OKQ8’ on the right hand. Take a left turn on to ‘ Nordlandergatan’, pass the Theatre and take a right in to ‘Kyrkstadsvägen’, Follow it pass the bridge and you will see the house on the right hand.